Doctors at Creedvue Mental Hospital are interviewing a patient named Adam Strange. His costume, rocket pack and weapons have been confiscated. Adam must warn the Justice League of a coming assault by Kanjar Ro. He used a Zeta-Beam to travel to Earth in an effort to warn his costumed allies. There is only one problem, and it comes as a great shock to Strange. The Justice League, a team of the world's greatest super-heroes, only exists in comic books. Having stolen information on them from the planet Rann, Kanjar Ro was able to hack into the Zeta-Beam that carried Adam Strange to Earth from there. With Kanjar along for the ride, the transportation ray is split into two. The villain's extra mass caused this. By the time Kanjar was detected it was too late to abort the activation. Wonder Woman has promised Adam's wife Alanna and her father Sardath that the Justice League will do everything in their power to find the archeologist-turned-space adventurer. However, they will have their work cut out for them, for Adam Strange has landed on Earth-Prime, a parallel world where the Justice League is nothing more than a group of fictional characters featured in DC comic books. Can the team find their lost ally before Kanjar Ro can put any of his viciously mysterious plans into effect? The Flash, Wonder Woman, Green Arrow and Zatanna are going to Earth-Prime to retrieve Adam via a Transmatter Tube, while Hawkman, Red Tornado and Green Lantern/Hal Jordan stay behind. The Tornado will monitor their progress, and Hawkman and Hal will search for Kanjar Ro. Both teams will use Zeta-Tracers to find their objectives. The Flash is able to get Adam out of the mental hospital on Earth-Prime in thirty-three seconds. Unfortunately, the space hero has no idea who Barry Allen or the rest of his Justice League friends are. He believes they are merely people dressed like comic book characters. It looks like the JLA's mission has hit a dead end. Because Adam is needed to aid the Justice League in stopping Kanjar Ro, the team on Earth-Prime is going over their options. Zatanna's memory spells could be too dangerous. Not one to give up, the Flash has an idea. The foremost authority on Adam Strange lives on this world. The Justice League need only to find him before Kanjar Ro's evil plans can go into fruition. While Green Arrow is watching over Adam Strange, Wonder Woman, Zatanna and the Flash enter the offices of DC Comics in civilian garb. They wish to see editor Julius Schwartz. The Flash met him some time ago in The Flash [Volume 1] #179, and many people there find the trio to be familiar somehow. The JLA need Julie's help to get Adam's memory back since he co-created him as a comic book character in this universe. He agrees to do so. However, he will need absolute privacy, like a secluded cabin, to aid Strange. Hopefully, the Man of Two Worlds can assist the Justice League before Kanjar Ro can be victorious over them. We now go to Earth-One, where Hawkman and Green Lantern are searching the Rocky Mountains for Kanjar Ro. The two heroes find their adversary, only to be overcome by Zeta-Beam energy. Kanjar has become a living receptacle of it, and its yellow color and intensity make him impervious to both power rings and Nth Metal. With Green Lantern and Hawkman defeated, the malevolent Kanjar Ro intends to take on the entire Justice League at once. There may be no way to stop him unless the Flash and the others can return with Adam Strange very soon. After Green Arrow stops Adam from escaping with bola arrows, Wonder Woman is forced to bind the space adventurer with her magic lasso as Julius Schwartz recounts various issues of Strange's comics that he had co-written with Gardner Fox and the problems they had in creating them. This eventually brings Adam's memory back. Now, he can help his friends in the Justice League discover what maniacal schemes Kanjar Ro has up his sleeve. 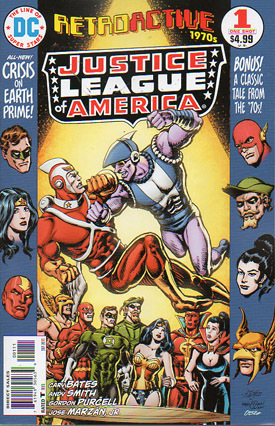 Can Adam Strange and the rest of the JLA defeat the villain before it's too late for Earth-One? Since he and Kanjar Ro had, in a sense, become one mind when the Zeta-Beam left Rann, Adam Strange is perfectly aware of his nefarious plans. Kanjar became obsessed with how Superman got superhuman abilities from a yellow sun, so he created technology to meta-form his mass until he become a living dynamo that could be powered by Zeta-Rays. Since he was getting a power charge on the way to the JLA satellite, Kanjar had energy to burn. This caused Adam to be catapulted to Earth-Prime. That isn't the worst of things, however. Another Zeta-Beam is scheduled to hit over eastern Peru in a few hours. Kanjar Ro plans to intercept it, and the Justice League must stop him from doing so. If they fail to defeat their adversary, he will become virtually invincible once he absorbs the Zeta-Energy. It's now 8:49 AM in Machu Picchu, Peru. The next Zeta-Beam will arrive in ten minutes. Hawkman has reunited with Wonder Woman, Adam Strange, Green Arrow, Red Tornado and the Flash. The battle with Kanjar Ro does not go well. Adam is forced to shoot the Flash, Green Arrow's arrows return to strike him, and a large vortex has taken Red Tornado. Kanjar celebrates as the zero hour approaches. However, he cannot sense the Zeta-Beam's energy within him. In fact, the only thing he really feels is Adam Strange's fist delivering a knockout punch. The Justice League allowed Kanjar Ro to defeat them in order to inflate his ego and use up his Zeta-Power. In addition to that, Green Lantern borrowed a refracting mirror from an observatory to deflect the Zeta-Beam while Zatanna's magic created harmless yellow light. With their foe now finally defeated, the Justice League take a picture with the camera in Wonder Woman's robot plane. The JLA has once again saved the day. An envelope has arrived for Julius Schwartz. He opens it to find a photograph of the Justice League and a bound and unconscious Kanjar Ro. It is signed, "Wish you were here, Your JLA pals & Adam." Story - 3: This one-shot is based on the period in which I discovered comics, and I've been reading them for over three decades. The 1970s DC and Marvel books were a huge part of my childhood. This story was as fitting tribute to the tales of the period, to the fans and to Julius Schwartz. Lord knows he deserves the accolades. Yet, I can't help but wonder if this is all there was to this issue. It's not bad, but it's not without its flaws. "Enter Justice League Prime" feels too long. There are certain points throughout the book that just drag to a snail's pace due to Cary Bates explaining things way too much. Some things didn't need to be spoon fed to the reader. Characters could have been given background for those unfamiliar with them in the place of long drawn out dialog or captions that tell us something we could have figured out on our own. The overall battle with Kanjar Ro seems to be only two or three pages long and feels anti-climatic. I expect the Justice League to take on foes that are too world shaking for just one hero. As he's written in this book, Kanjar Ro feels like a second rate villain that a girl scout troop could have handled, and that's a darn shame. The whole 'making a hero think he's gone nuts to the extent of thinking his life is nothing but fantasy' has been done before. Then again, so have comics featuring Julie Schwartz. Some might think those things have been done to death, and in a certain sense, they'd be right. However, this comic is decent enough to let the retreading slide a bit. Still, part of me did expect something more from Cary Bates to a certain degree. DC Retroactive: Justice League of America - The 70s was still a fun book in spite of its problems. I sincerely felt like a kid again as I read every page. Thanks a million DC for these Retroactive one-shots. I hope there are more of them in the future. Art - 5: I really liked the artwork in this one-shot, and the transition between the two different styles doesn't punch the reader in the eye as most books with more than one penciller tend to do. The visuals honestly worked perfectly to suit the atmosphere of this issue. Cover Art - 5: One could forget that this cover is from 2011 as it feels like it comes from the classics of the Bronze Age. DC, Andy Smith, Ernie Colon and Carlos Badilla really delivered the goods with this one.